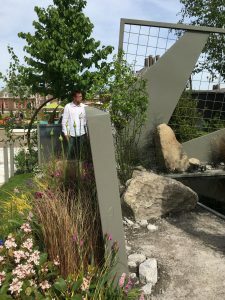 A whole week has evaporated since the Chelsea Flower Show visit. I’ve examined my pics and scribbled notes and here they are. A little old hat by now. I swear this lady wears this hat every year. Definitely photographed her before. 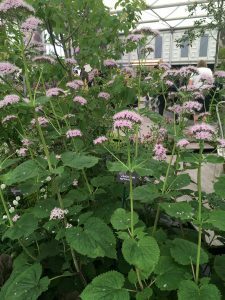 The sleuthing visit of one day gives a sort of hysterical edge to fitting everything in: plants, design, new products and talking to as many exhibitors as possible. A little like visiting an art gallery and lingering with every picture. The mind begins to go pappy. 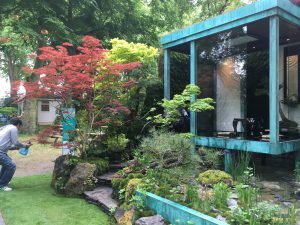 Kazuyauki Ishihara, helped by gardeners and technicians flown in from Japan, had made a garden that sang with simplicity and a lot of moss. I just love moss, even if it has to be shipped in from Sweden. 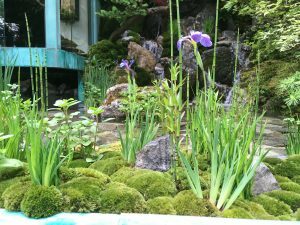 Are there moss gardens in Japan? I really hope so. 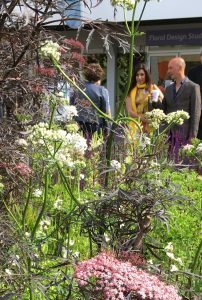 The show gardens in the Main Avenue sway to a completely different drumbeat to the endearing Artisan gardens with stalls in the bosky bit of the Royal Hospital gardens. Main Avenue is full of television gantry and nervous exhibitors sllcking their hair back, ready to talk to microphone. There is a sense of the unachievable being executed and wallets being fatly turned inside out. 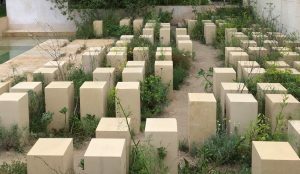 M and G garden took the concept of an old quarry in Malta and exhibited the heat-loving plants that would have colonised the place. Mr Basson was tweed clad and preoccupied so I had a chat with his wife. Any indication of budget? She could not possibly divulge. 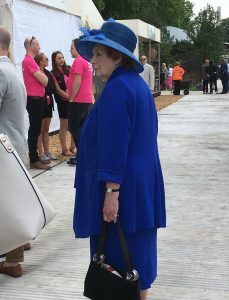 Opposite the quarry, all was very chic grey with Charlotte Harris besuited, matching the hard landscaping of her stand. There too was Hugo Bugg – nothing to do with the stand but one of the Harris Bugg Studio newly launched. Hats off to Harris for pared down planting emulating Canadian forests with succession plants. 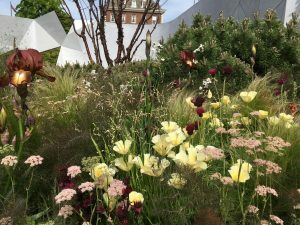 At the end of the avenue and fronting an exhibit t hat looked like a floral space-ship newly docked from Mars, the RHS Greening Grey Britain Garden. I saw Nigel Dunnett there but was too shy to ask whether he was sponsored and paid for by RHS. Imagine this must have been so. The message here was to recreate a jolly urban space with flowers and vegetables nurturing community . Dunnett is an advocate of water-sensitive design. This and recycling were on show. A dead attractive stand. There is another category of show gardens that are sprinkled around the northeast end of the showground. These are called Fresh Gardens. “all have a message to deliver through the media of their design and horticulture”. 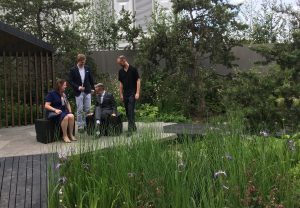 Ian Price has created a garden that is a symbol of the depression that he has lived with. “Mind Trap” Is a very clever from name and concept through to the planting. The centre of the small site gives the sense of entrapment. Ian is out to normalise the stigma and secrecy that surrounds mental health. Of the planting throughout there was little to get me scribbling in my note book – so many weeds and wild plants dominated the stands. 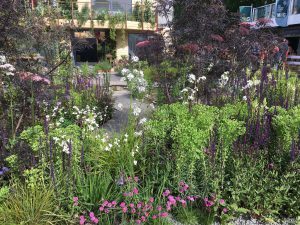 One stood apart and this was a garden designed by Matt Keightley and planted for Texture with a ravishing selection of perennials supplied by Hortus Loci. See my picture below. And I hold with that in the Great Marquee too. As I trawled the aisles back and forth, the oxygen of the new seemed absent. Except in one category. Umbellifers are on the march. This is Valeriana pyrenaica. I spotted Marina Christopher eyeing up the umbelliferous centrepiece of the Binny Plant Stand (intersectional peonies to you and me). Her book on the subject comes out next month. Be prepared for an invasion.